Happy CYBER MONDAY Jaderbugs! 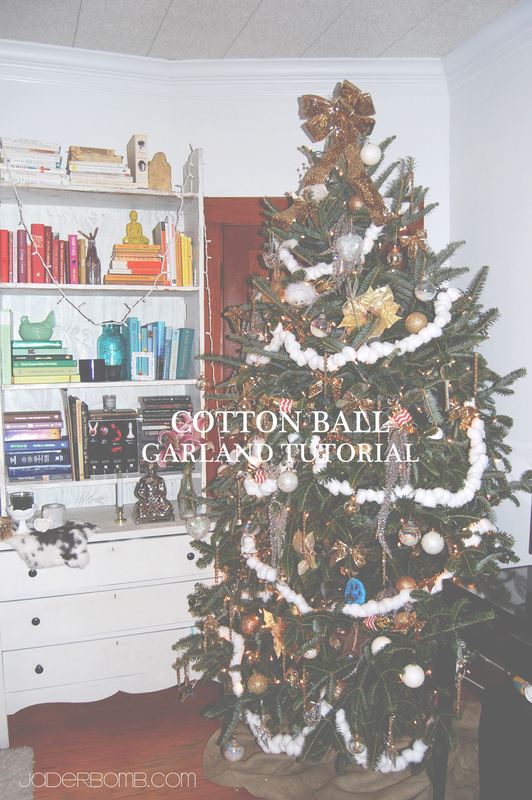 I hope to have all of my tutorials up before the end of the week showing you all of the “cheap” ways I decorated our Christmas tree. I always believe when you make your own things they look so much better than store bought items. Don’t cha agree? Today’s tutorial is so soft and fluffy. When I was in the store the other day I started looking at garlands and when I saw the prices on them I was like “ER MY GERD”… I couldn’t get over the prices of them. I figured out in that moment I would make my own. I wanted something to look like SNOW… Then it clicked. I purchased all of my ingredients at Walgreens. 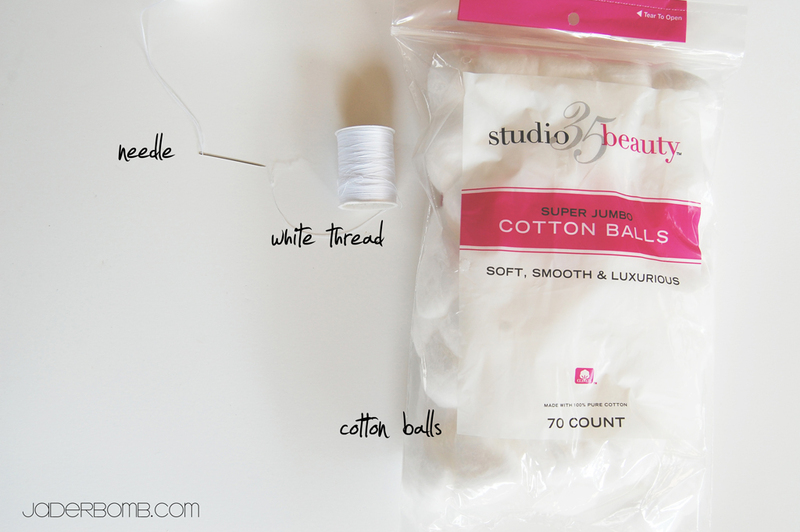 Make sure when you purchase your cotton balls that you get the JUMBO ones. I accidentally got the small ones and you can totally tell the difference. The big ones look so much better. Start off with ONE large cotton ball. 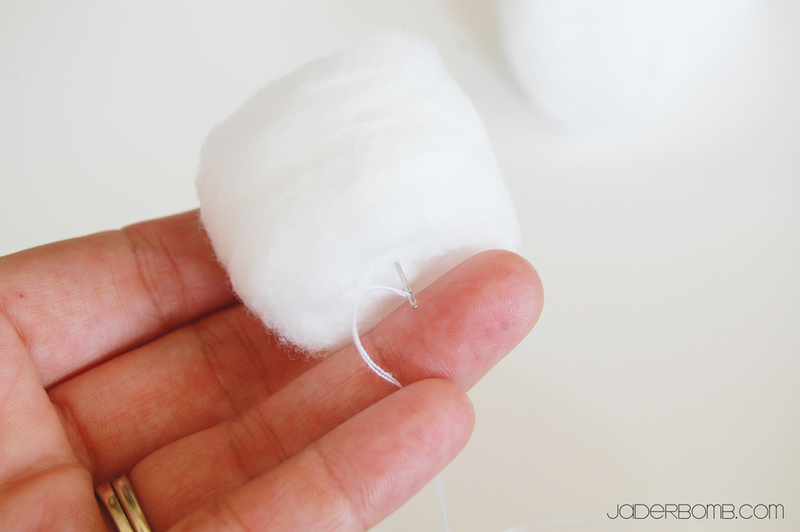 Carefully string your needle right through the center of the cotton ball. Pull the string through and continue until you have enough for your tree. One piece of advice. I though I could have ONE long garland but because you are using thread it sorta breaks easily if there is too much weight. 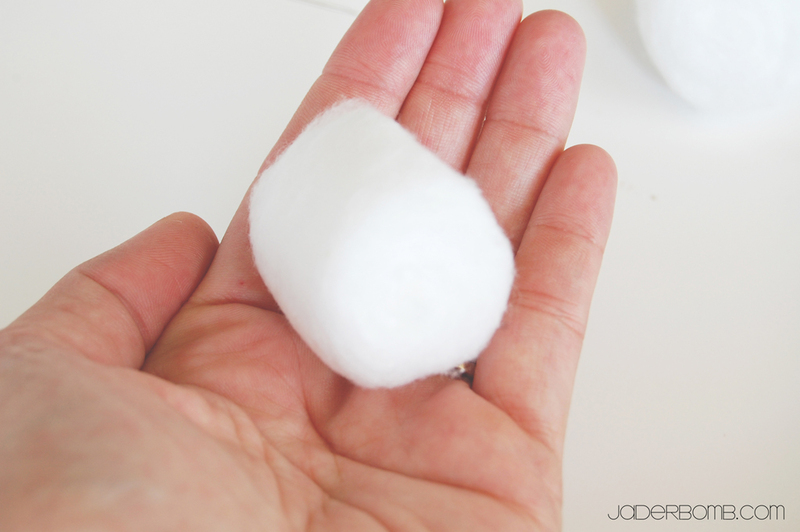 I know you are prolly thinking…cotton balls, weight. Trust me it breaks. 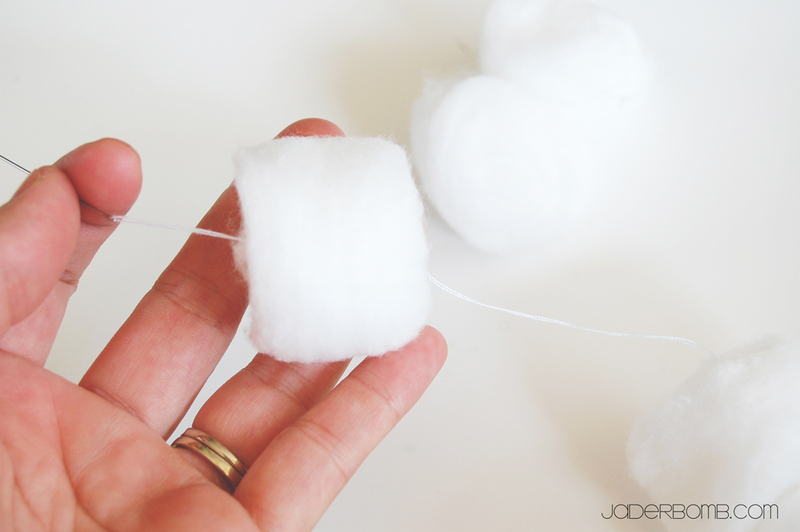 I like to do about 20-30 cotton balls and then stop. It just works better. 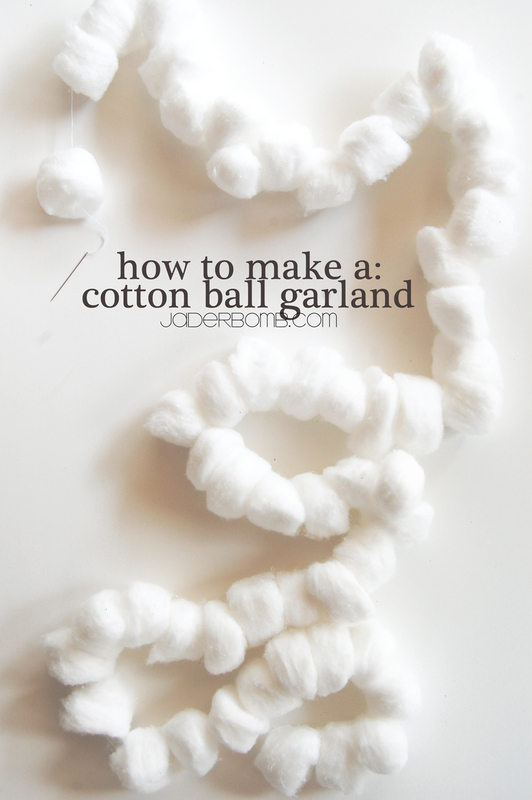 I am sure if you used the small cotton balls you could make one big garland but these jumbo babies are huge! This is what you will get JADERBUGS! It’s so much fun right. I really like it because it’s super affordable and honestly. I think it looks better than a store bought garland. Here is ONE of our trees in the house. Tutorial coming soon on how we make this bookshelf so stay tuned! If you decide to make one please post it on my Jaderbomb facebook page! I love showing the things you make. So cute and fluffy looking. People might think you have marshmallows on your tree. Wouldn’t that be fun and gooey. Love the hand made and thrifty projects. I’m a new subscriber. We’re doing handmade stuff this year more than ever. No money and 2- 5 week months in a row will do it every time. We get our SS the day after Christmas, boy what timing. Found you thru “My very educated Mother”. JaneEllen: It does look like Marshmallows right! It would be fun to just grab one off of the tree and eat it! haha So glad you are here! 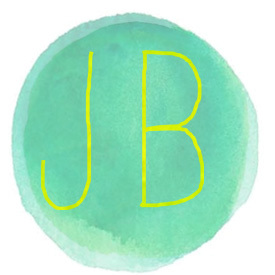 Welcome to the Jaderbomb family! Kid proof needles are tapestry needles! 🙂 They are bigger with a blunt end 🙂 I love this DIY craft, soooo going to do it with my 3 year old! Tapestry needle….and for one long garland….FISHING LINE! Oh yeah, baby, we are rocking this out this year. I will post picks when we are finished!!! Thanks Vikki! Share your pics with me when you are done! Happy Holidays!